Born in a poor family, Milani studied with Lorenzo Pasinelli and Cesare Gennari. He developed a personal mannerism, taking distance from the late Baroque and rediscovering the mighty style of the Carracci. He studied their works in the house of his protector Count Alessandro Fava and those in the Palazzo Magnani collection. To support his large family Milani moved to Rome in 1718 and remained there for many years. Cardinal Camillo Paolucci commissioned him fresco paintings for the church of San Pancrazio in Albano. He painted altarpieces for the church of the Bergamaschi, for the basilica of San Giovanni e Paolo al Celio and for the apse of the church of La Maddalena. His altarpieces are also in the church of San Marcello al Corso, and he frescoed the Galleria of Palazzo Doria Pamphili. . The two biographers of Milani, Giampiero Zanotti and Luigi Crespi, both remarked that Milani had a higher reputation as a draughtsman than as a painter. 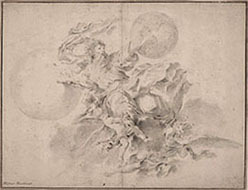 I mention here the words of Luigi Crespi, emphasizing his outstanding draughtsmanship Ha disegnato moltissimo, e veramente i suoi disegni, possono andar del pari con quelli di qualunque grande maestro, pel carattere, per la prontezza, per la grandiosità, e per la disinvoltura con la quale sono toccati, lumeggiati, e macchiati.